This newly refurbished apartment is in a quiet gated complex. The modern kitchen is well designed with plenty of storage space and all modern conveniences. There are 2 double bedrooms with en-suite bathroom, en-suite shower and separate WC. It has a large south facing sunny garden level patio with sun beds, table and chairs perfect for al fresco dining. Large swimming pool and children's pool, tennis court, Internet access, SKY TV, DVD/CD player all included. Location: Situated between the cobbled streets of Old Antibes and the endless attractions and excitement of Juan Les Pins this apartment provides a relaxing space for a family holiday. 5 min walk takes you to the local supermarket, fruit shop, boucherie, cafe and boulangerie of Roi Soleil whilst a 5/10 min drive will take you to either the wonderful town of Antibes with its beautiful ancient squares, mediaeval streets, bustling food market and dramatic coastline and beaches or to the upmarket resort of Juan Les Pins, with its beaches, boutiques, nightclubs and local and international restaurants. If you want to travel further afield, a 20 min drive will take you to the ancient villages of Mougins, Valbonne or St Paul de Vence or the elegant town of Cannes. Golf: There are a number of golf courses in the immediate vicinity. Approx 20 min drive. There are so many places you can access from Antibes. one hour and half away are the mountains for skiing if you fancy, further along the motorway you are in Italy ... or drive into Provence, so just wander down into beautiful Old Antibes which hasn't changed in a bit in all these years. We really enjoyed our time at the apartment. Pros: The location is fantastic, you are nicely situated in between Cannes and Nice and it is only ten minutes by car from Golfe Juan (best beach ever!) and Juan Les Pins, and 20 mins from Nice airport. Secondly, the apartment itself is lovely, it has 2 bedrooms and with our 3 young kids the space was absolutely fine. As the apartment is on a ground floor, there is no need to use lifts etc, and we would often eat out in the garden at back which was surprisingly spacious. Unlike other holiday apartments we have stayed in we found that the appliances whilst not necessarily brand new are of a high quality. What we particularly appreciated was the personal touch: the cleaner opened up the apartment for us on arrival (we had to call when we were 20 mins away), the owner provided a welcome food basket, and we were able to contact the owner whenever we had any questions. The big attraction of course is the very well maintained pool, which is large and has a baby pool. The pool was rarely very full and there was always a bench free to ourselves. There were a few very minor cons, such as the need to park outside the complex (in practice this was an additional 30 second walk, and we could always find a car park space), the shower divide needed some fiddling to use, and the TV also needed fiddling to get working (although we had no trouble getting in contact with Lionel and he was very happy to help with this). However, these were very minor and I have just included for full disclosure. We had a great time, and would love to come back! We had a lovely two week holiday at this apartment. It is exactly as described by the owner. We are very experienced with self-catering apartments across many countries but this property offered one advantage over others. As other reviewers have mentioned, the apartment is very clean and well maintained. The advantage over other self-catering apartments is that it comes stocked with many things you will need (which you should replace as a courtesy to others) such as cleaning materials, dishwasher tablets, coffee filters, pasta, tinned goods and even wine! All the essential machines including a Nespresso are available. There is digital and satellite TV but also an Android device giving access to Netflix and online TV services. Tthe local manager met us at the gate, which as we arrived late on a Sunday night was very much appreciated. There is a garage but it is a very tight fit so everyone just parks on the roadside. We were also able to depart in the evening on our final day. The apartment is on the ground floor with a shaded patio area allowing lovely al-fresco dining. The air-conditioning is quiet and effective. There is fast wifi which coped with our teenagers heavy demands. All the beds were comfortable with linen provided and ample towels. The whole complex is peaceful, meticulously maintained and clean. The complex manager is constantly busy and visible. There is a lovely pool set in the grounds. It is about 10 to 20 minutes drive to the coast depending on which one of the beaches you wish to visit and motorway access is convenient. There are local shops including a boulangerie 10 minutes walk away, up hill on the outward trip. The local bus line is also available at these shops with very cheap prices, ideal for sending the teenagers off on excursions. Antibes also boasts the largest supermarket I've ever seen. There is a very good Italian restaurant within walking distance, very highly reviewed on TripAdvisor with a very friendly owner. We also walked to Juan Les Pins on several evenings but it a good stretch of the legs. Good exercise after a large meal. Taxis aren't too easy to secure but I noticed Uber was available. If you're a runner, the beachfront is obviously ideal in the early morning. Communication with the owner were excellent. The apartment comes highly recommended for a quieter location but close to most amenities. We have just returned from a fantastic holiday at this apartment. After having some bad experiences with self-catering apartments in the past we were anxious when booking here - but we really needn't of been worried. The apartment is very clean and well maintained. Not only is it stocked with everything you will need (which you replace as you go along), the local manager provided an array of essential groceries on our arrival, which as we arrived late on a sunday was very much appreciated. The apartment is on the ground floor with a secluded patio area allowing lovely al-fresco dining. The kitchen is equipped with all the gadjets, the air-conditioning works extremely well and the wifi was fast, which pleased the kids. All the beds were very comfortable with linen provided. It really felt a home from home. The whole complex is peaceful, meticulously maintained and clean, with a lovely pool set in the grounds. It is about 10 to 20 minutes drive from the coast depending on which one of the numerous beaches you choose to visit. There are local shops 3 mins drive away and branded supermarkets 10 mins. Antibes itself is bursting with character and the old town was a particular favourite - although I will say parking could be quite challanging as this was peak season. Communication with the owner was fantastic. We were kept informed of all we needed to know via email or phone. If I were to be really pedantic to find any faults I could only say parking at the apartments could be tricky. If we couldn't park on one side of the approach road and parked on the other we, and others, would receive an unofficial notice on the car as we had obviously upset someone - but that's it. All in all we had a great two weeks holiday and I would reccommend this apartment to anyone looking for a relaxing, comfortable break. We enjoyed our stay on this apartment, it suited 4 people well with two ensuite bathrooms and tons of wardrobe space. Kitchen is equipped with all bits and more you may need to cook up a meal, loads of plates and glasses which was great. I got the feeling this apartment is used more as a home rather than just a holiday let. Full size fridge. Pool area is great, never too crowded. Walking distance to shops, but the larger Casino on the bottom of the hill was a bit of a climb up back in the heat. Nice terrace with afternoon sun. Good quiet A/C. All in all a great place. We will seriously considering staying here again when we are back in Antibes. Good communication with both owners and their care person based in Antibes. Highly recommendable. Perfect holiday, Will come again! Perfect way to have your holiday. We arrived as a family and from now on this is how we are going to spend our family holidays. The flat was clean, with all the facilities we needed. amazing garden, close to the beach and to center of town. We had an excellent stay in this apartment. 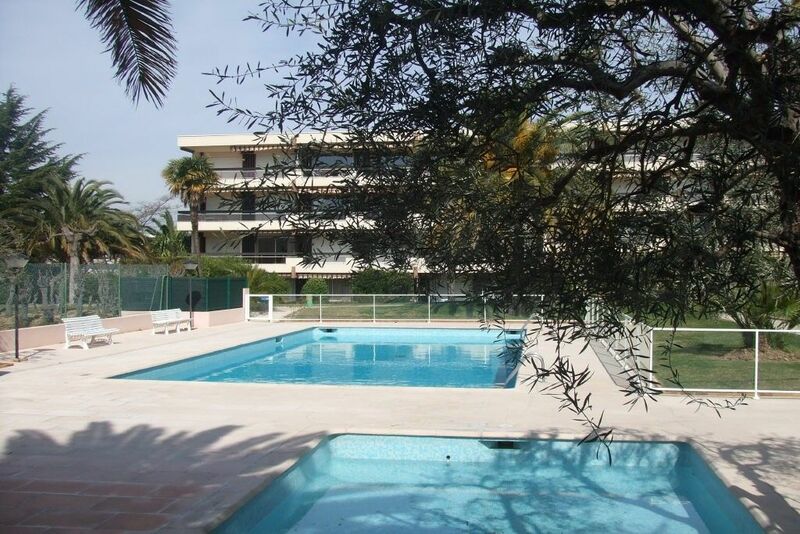 Its location close driving distance from juan les pins and antibes old town gives you a really great variety of things to do but equally the apartment complex was great for staying home. Plenty of space in the grounds for the kids to run around and huge pool & tennis courts. the apartment is practical and comfortable (especially with the air conditioning), it was perfect for our family and we were quite pleased for the kids TV channel in english (via sky). Thanks a lot for a wonderful holiday, book us in for next year! Situated between Nice and Cannes and 13 km from Nice Cote d'Azur International airport, Antibes possesses one of the most stunning coastlines in France. Antibes is a wonderful town to explore with its beautiful ancient square, medieval streets and Provençal houses. It boasts many fascinating museums including the Picasso Museum. There is a bustling market that takes place every day (except Monday) in the Cours Massena. Here you will find wonderful displays of meats fish cheese olives, fruit vegetables and wine. The Square sheltered by trees comes to life when the restaurants spill out into the middle of the square. Juan Les Pins also has a stunning coastline, beautiful beaches, shops, restaurants, nightclubs and of course their famous firework displays. A 20 min drive will also take up to the medieval towns of St Paul de Vence, Cagnes and Mougins and for the young at heart there is also Marineland, and AquaSplash a short drive away. Golf: 18 hole golf course in Biot and Mougins. 9 hole golf course in Sophia Antipolis and Valbonne.